Before I joined the Cass Full-time MBA, I was working as a Relationship Manager at Standard Chartered Bank in Nigeria. I had received an email from Cass five years earlier and checked out the website. Plenty of things impressed me about the School – location, rating, length of programme – but it wasn’t until a family friend attended Cass and told me what a great experience he’d had that the deal was sealed. When I enrolled, I was keen to go into the FMCG sector, but my plans would change several times during the course of my MBA. When I started at Cass, the diversity of the environment quickly caught my attention. My cohort contained students of many different nationalities and it was exciting to discover the varying backgrounds of my classmates. At the same time, it all felt really natural. I was also impressed by the faculty – the approach to learning seemed very practical, and almost all the academics had current or past industry experience, so what they said felt authentic and relatable. The International Consultancy Week was an important part of the MBA programme for me. We travelled to Poland and my group was assigned to a company called Sealed Air Corp. We developed a simple, paper-based evaluation system for the shop-floor staff, but what was really interesting about the exercise was that it challenged my views on management. I learned that there can be no one-size-fits-all solution when people are involved. I used my elective choices to explore new areas, taking as broad a range as possible to help me develop new capabilities. The Las Vegas international elective was an eye-opener because there was so much to learn in terms of history, strategic marketing, CRM… the list is endless. Taking a trip to Las Vegas may sound like an easy option but I think it might be the most demanding elective and I highly recommend it. The Business Mastery Project was another exciting part of my Cass experience. From sourcing a company to the development of a plan, the entire process was thoroughly satisfying. Though it didn’t have a direct impact on my career choice, it did give me an insight into the hospitality sector and how start-ups and their founders operate. The teaching at Cass encourages you to think deeply about how a business can be improved. This principle never leaves you – it’s a theme running through the programme and, over time, it becomes second nature. Today, I tell everyone who cares to listen that you cannot experience the Cass MBA and come out of it the same person. Back in the day, I used to see restaurants, websites, buildings… but now I see businesses. I am thinking about their profitability, whether their revenue is seasonal and weighing up a host of other considerations. My MBA experience revolutionised the way I think. But even though Cass may transform the way you think about business, you will never feel pressure to be anything but yourself. I had tried several times to switch industries before my MBA but had no luck. 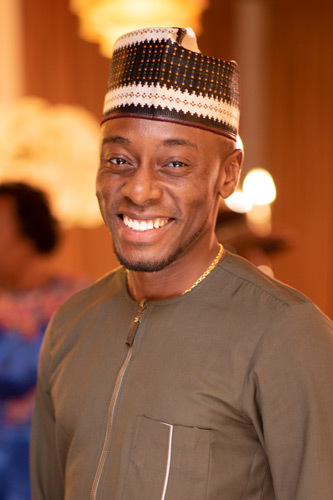 Afterwards, however, I knew I had the knowledge, skills and confidence to make the change, and I am now the Business-to-Business Lead for Unilever Nigeria. My time at Cass was rich in learning, diversity and friendships – it was definitely one of the best years of my life.